Sunrise Highway. Windows. Kool Kat Musik. Time again to appreciate the old theory of the cream rising to the top as skimming through the review CDs this unassuming disc almost immediately grabbed attention. I say almost immediately as the opening title song, while a thoroughly fine wisp of summer jangled pop didn’t prepare us for the shift into a heavier gear, a fuzz fuelled psychedelic haze with all the hallmarks of The Beatles circa Rain allied with latter day wizards such as Julian Cope on the following song Breathe. Five minutes of blissed out bliss. Next we’re in the retro world of The Fleshtones with the mighty garage pop swagger of Peter Pan, stomping power chords and deadpan vocals chiming together with an innocent sense of pomp and circumstance. Foreverland continues in this vein and by now the listener could be forgiven if they’re wondering if Sunrise Highway are a cloak and dagger covert operation of The BMX Bandits, Scotland’s finest purveyors of Beach Boys garage cool. However it transpires that Sunrise Highway are a New York bunch helmed by Marc Silvert who writes all of the songs here while he also sings and plays guitar and keyboards. There are 14 songs here and with the exception of the aforementioned title song the album is a treasure trove of jangled guitar rock with hooks galore, glorious harmonies and just the right amount of freakbeat. There are moments here of sheer bliss that demand the volume be cranked up and the remote set to repeat with Call Waiting in particular crying out for attention. A sneered vocal whines away, frustrated and sick as the band crunch on laying down layers upon layers of guitar and harmonies building up before a key shift leads to a fractured climax. It’s a minor pop nirvana. While they don’t top this there’s plenty to enjoy in the remainder of the songs. Cinnamon Eyes is an off skelter guitar romp that threatens to teeter into Eastern scales but instead dances on the edge with guitars igniting like sparkplugs. Excellent! Oisin Leech and Mark McCausland, the Irish duo who are The Lost Brothers make beautiful music together. Since teaming up in Liverpool in 2007 they have seemed to be conjoined at the hip (or throat) as their superb harmony singing has graced three albums and led to performances at the infamous Midnight Ramble at Levon Helm’s studio complex and more recently appearing live on Russian television. Invariably they’ve been compared to both the Everlys and Simon and Garfunkel due to the vocal setting but it’s fair to say that the pair are also very fine songwriters who have a knack of teaming up with simpatico producers and players giving each of their discs an individual personality. Having recorded previously in Portland, Oregon, Sheffield and then Nashville (with Brendan Benson in the producers chair) for their previous releases New Songs of Dawn and Dust finds them back in their old stomping ground of Liverpool with ex Coral guitarist Bill Ryder Jones producing while another Coral member, Nick Power adds keyboards and writes one of the songs here. In contrast to 2012’s The Passing Of The Night which featured an excellent studio country band (including Gil Landry and Paul Brainard) here the music is pared back for the most part with the Brothers’ voices and guitars complemented on occasion by piano and drums and occasional trumpet allowing the harmonies full rein to shine. The album opens with the gentle and lilting Spanish Reprise, described by the Brothers as “a Mexican sunrise over the Mersey.” Similar in mood to the cantina instrumentals on Willie Nelson’s Spirit album it serves as a bridge from the avowed Americana of the last album to the comparatively muted new world influences on the songs that follow. Day’s Ahead showcases the reasons for the comparisons to Phil, Don, Art and Paul as the Brothers deliver a jaunty acoustic guitar scrubbed cousin to Wake Up Little Susie with Mariachi trumpet adding colour. On Derridae however they take a cowboy lope and marry it to an Irish mysticism as they sing about a girl who weaves spells capturing hearts. It’s a beautiful song that features Leech and McCausland at their best, troubadours of the West and the Celtic heartland. Soldier’s Song is another winner with a simple guitar melody adorned by a mournful trumpet while Poor Poor Man harks back to a rustic and simple ballad form with a Woody Guthrie feel while the trumpet ( by Martin Smith) again adds a forlorn air. Gold And Silver reminds one that the Lost Brothers often refer to dusk and darkness (witness the album title) and is the sparest song here as an evocative and solitary guitar allows their voices to shine with a crepuscular glow as they sing about the lure of riches and the resultant price to pay, “raining down like poison showers.” This sepulchral element is highlighted on the closing song, the stark and majestic Stones Throw which throws up shivers for the listener as Power’s dramatic keyboards echo under the twilight vocals with the end result having a similar emotional heft as Leonard Cohen’s Hallelujah. 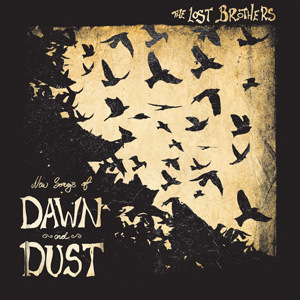 New Songs of Dawn and Dust is in essence a fantastic album, a mature work from a duo who are well able to deliver these songs in a live setting stripped of the studio trappings. The Lost Brothers will be touring on the back of the release with some Scottish dates included. See here. Jon Budworth. Trees Turn To Fire. While Blabber’n’Smoke would never profess to be well versed in traditional folk music there was a time way back when bands like Fairport Convention and Pentangle were an entry into a world of musicians who were trying to square alternative lifestyles with a particularly Anglicised (and occasionally Celtic) tradition. Groups such as The Incredible String Band, Comus, Steeleye Span and The Albion Band were hip, sharing stages with the rock bands of the day. Rob Young wrote about this phenomenon in his book, Electric Eden (with a fine CD to accompany the book as recommended here) and it’s been gratifying recently to find that there has been a mild resurgence of interest in the idiom both here and in the States. All of this is by way of introduction to Jon Budworth, a guitar teacher from “deepest darkest Lancashire” whose second EP has found its way here. As you might expect from a tutor his guitar playing is excellent; he cites his primary inspiration as John Renbourn while Richard Thompson and Nic Jones are also name checked in his bio. What really grabbed attention however on this six song set was Budworth’s ability to pen songs that hark back to an England tied to the land, pre industrial, clinging to the seasons, all delivered with a fine sense of brio with Budworth accompanied on various songs by accordion ( Bernard Cromarty) and violin and viola (Elliot Moore). At its best as on the traditional Searching For Lambs, a haunting mist laden tale straight from Thomas Hardy country or Budworth’s own When Will My Harvest Come Home? where he summons up a percussive drive that would sit well in a Levellers’ set he has a firm hand on Albion’s past, it’s stirring stuff. Dusty Roads tops these however as Budworth picks his way through a simple song that is wintry and desolate as his character attempts to woo a love with poetic, Shakespearean comparisons as the English Civil War rages around them. Muffled cannon fire and musket rounds complete the illusion. There are some caveats here. The sound on the EP is brash and somewhat tinny while Budworth’s voice occasionally strains to hit the right note, nothing that can’t be sorted with some more experience for sure. The second cover on the disc, Paddy’s Lamentation, transposes the action to the new world where an Irish immigrant is drafted into the American Civil War. With a Celtic feel to it Budworth does struggle to sing with conviction leading one to suggest that he stick to exploring the byways of old Albion as on the songs previously mentioned, all evidence that he has the skills to go down this road. Definitely one to watch however and in the meantime you can buy the CD for a measly £2.49, much less than the price of a pint so why not give it a go. Luke Tuchscherer. You Get So Alone At Times That It Makes Sense. “Drummer makes solo album” is seldom a cause for celebration (there are exceptions of course, just see Levon Helm and Simone Felice) but in the main it’s not the best of news. It does help if the drummer in question has a track record as a writer and singer and Luke Tuchscherer ably manages both duties in addition to the sticks in his day job with country rockers, The Whybirds. While The Whybirds muscled up on their last release, A Little Blood, at times coming across as a power trio, here Tuchscherer goes in the opposite direction, ditching the rock in favour of an excellent set of acoustic based songs which hark back to seventies LA country folk with pedal steel, keyboards and occasional strings sweetening the mix. The album title is a direct lift from a volume of poetry by Charles Bukowski, barfly and bum, a man able to create art from abject degradation and the privations of a serious drink habit. Gritty stuff but while Tuchscherer dwells for the most part here on lost love, fumbled lust and solace in drinking his writing is more of a doomed romantic bent with little of Bukowksi’s self disgust. Rather he recalls the existential emptiness of Townes Van Zandt, forlorn and resigned, telling a tale over which he has no control. Indeed there are moments on the album such as (To Make It Worse) I’m Falling In Love Again with its weeping cello and mournful harmonica which recall Townes on the likes of Our Mother The Mountain. There are shades of other forebears on the album with the snarly Dobro driven (Lord Knows) I’m A Bad Man recalling Steve Earle while Three Long Days lopes along like one of Steve Goodman’s bitter sweet laments. In the main however Tuchscherer takes on familiar styles delivering his downbeat tales with sweeteners such as the breezy Bakersfield sound on When Day Is Done and The Band like rootsy stomp of One Of Us. Women is a sprightly country gem of a song with some sparkling mandolin but the standout song is Hold On with its wearied vocal refrain and superb acoustic bedrock adorned by some evocative guitar stylings. Tuchscherer’s blessed with a fine voice, slightly weary in its delivery and he’s ably supported by Whybirds band mates, Dave Banks on guitar, mandolin and banjo and Ben Haswell on guitar along with Max Hart on piano and pedal steel, Nick Mailing, bass, Simon Rinaldo, Hammond and Chris Corney on Dobro, banjo and lap steel at various times while producer Tom Peters handles drum duties. While the Whybirds remain a going concern it appears that Tuchscherer has assembled his own band, The Penny Dreadfuls, to accompany him on some live dates. Hopefully he’ll make an appearance north of the border at some point soon. Cahalen Morrison & Country Hammer. The Flower Of Muscle Shoals. Free Dirt Records. Regular readers will know that Blabber’nSmoke are huge admirers of Cahalen Morrison and Eli West whose three albums have been superb bare boned distillations of what one might call the high church of Americana. Their pure and simple sound of acoustic instruments allied with lonesome voices recalls the pioneers of country music and the land around them. Tradition just about sums them up (while at the same time selling them short as they are as current as any of the big Nashville hitters). Cahalen Morrison continues in this vein with this offshoot release, The Flowers Of Muscle Shoals, recorded with his band Country Hammer. While Morrison & West are rustic, hewn from the ground, here Morrison moves into the city and finds that musicians are plugging in, adding some swing, finding honky tonks to play in, adding some Western to his Country. It still sounds as old as the hills but this time the audience are not on a back porch, more likely they’d be huddled around a radio catching static and occasional Grand Old Opry airwaves. The Carter Family have given way to Hank Williams. Morrison is ably assisted in this venture by the magnificent Country Hammer, a country super group of sorts with Jim Miller and Rob Adesso on Telecaster and harmony vocals, Ethan Lawton on drums, Mary Maass on fiddle, Country Dave Harmonson on pedal steel and Michael Connolly on bass and accordion. Together they offer tear jerking ballads such as Through Your Window which limps along as if it’s four in the morning and the band are still playing for the last couple on the dance floor rebounding from the earlier fiddle led heartache of Over And Over And Over Again and the desolate I’ve Won Every Battle And Lost Every War, a magnificent lament. There’s more heartache albeit with a jauntier step on Sorrow Lines The Highway Of Regret, some Honky Tonk heaven here and they continue in this sweet and sour vein with the rousing Our Love Is Like A Hurricane, fiddles flying and guitars fatbacking in the best Western Swing tradition. Morrison’s vocals are stained with a sepia soak, at times recalling the late Levon Helm, and when they launch into the Cajun influenced San Luis one could be forgiven for thinking this is a Band outtake. Essentially The Flower Of Muscle Shoals is one of the best albums we’ve heard this year and it is heartily recommended. Seems to me that the UK is like Crosby, Stills, Nash and Young. England Ireland and Wales were all getting along but needed some oomph. So Scotland was invited to add some bite and fire. Although the others had flashes of brilliance it was Scotland who revved up the engine. Spectacularly successful at first, world dominion, empire and all, Scotland began to chafe against the others, aware it had so much more to offer. So, eat a peach Better Together. We might be heading for the ditch but it’s much more interesting there. Ash Gray. Once I Got Burned. Our recent Indian summer was an opportunity to listen to some “sunny” music and going through some CDs I noticed that Texan Ash Gray’s debut album was still in the pending file with its release date well and truly missed. Fuzzy recollections of a first listen to the album were of some shining pedal steel, reason enough to bang it back into the CD player and give it another go. Fortunately a fine decision as Gray’s songs are of a sunny type, not so much in the lyrics but the winsome acoustic guitars, the deceptively care free delivery and, yes, some shining pedal steel is definitely the sort of music you would want wafting around as you laze on a porch or in a garden sipping something cool and with the sun shining late last week we did just that. Of course there’s little point in recommending a summer album just as we head into the darker nights but this isn’t the Beach Boys and Gray’s light tenored voice and the overall excellence of the majority of the songs here are just as well savoured indoors particularly the honky tonk styled Whiskey Down and the beguiling Needlecase which comes across somewhat like a meet up between Ray Davies and Neil Young. There’s some power pop brashness on 55 which recalls Tom Petty’s early offerings with jangling guitars galore while Waiting For The World sashays between cantina culture (courtesy of some very fine acoustic guitar from Paul Caruso) and portent with its Dylanesque lyrics. The opening title song is another poetic piece stuffed full of fiery imagery but Gray really gets into gear with the following Two Lane Blacktop, a ramshackle ride of a song that has the looseness and vibrancy of Uncle Tupelo as the guitars corkscrew their way through a classic road song. Santa Fe Sound on the other hand swells with the aforementioned pedal steel soaring over and around the vocals with Nina Murphy harmonising with Gray. There’s a folky element to Fiddler’s Son which showcases Gray’s own fretwork as sparks fly from his acoustic guitar in a manner reminiscent of Bert Jansch, a feat repeated on the country blues of Black Muddy Woman where again his guitar playing stands out.